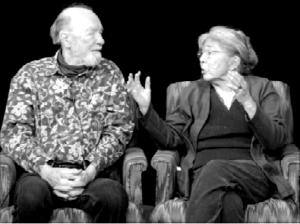 BEACON, N.Y. — Toshi Aline Ohta Seeger, wife and partner of legendary folk singer and activist Pete Seeger, died peacefully at home on July 9 at the age of 91. She was a community volunteer, festival organizer, writer, filmmaker, road manager, potter, loving mother, grandmother, great-grandmother and aunt. Her family said she will be remembered for her compassion, dedication to causes, as a matriarch within her family and local community, and for her cooking and elaborate organic garden. The daughter of an American mother and a Japanese father, Toshi Seeger was born on July 1, 1922 in Munich while her mother was traveling in Germany and came to the U.S. at six months of age, taking up residence with her mother, Virginia Harper Berry from Washington, D.C., and father, Takashi Ueda Ohta from Shikoku. She lived in Greenwich Village and Woodstock, N.Y. in the 1920s, ’30s and ’40s. Her parents and half-sister were a part of the theater community and she grew up surrounded by the arts. Seeger attended The Little Red School House in New York City and graduated from the High School of Music and Art in 1940. She met her husband in 1939 and they married in New York City in 1943, while he was on leave from the Army. She passed away 11 days shy of their 70th wedding anniversary. The couple were partners in every sense of the word, collaborating on everything from building their log cabin to organizing festivals big and small. Family and friends said this was made possible only through Toshi Seeger’s tireless work, creative mind and meticulous organizational skills. She served on the New York State Council of the Arts, marched with Dr. Martin Luther King from Selma to Montgomery in 1965, and collaborated with her husband’s manager, Harold Leventhal, on thousands of projects. The Seegers took their three children — then 17, 15 and 8 years old — around the world, giving concerts and making field recordings and films in 28 countries. In the 1960s, Toshi Seeger was instrumental in the early years of the Newport Folk Festival and helped discover bluesman Mississippi John Hurt. An untrained filmmaker, she co-produced, directed, shot and edited films about music from all regions of the country and the world. Many of her films are now at the Library of Congress. She co-founded the Hudson River Sloop Clearwater organization and Clearwater’s Great Hudson River Revival, and initiated things that were rarely done at festivals in the 1970s and ’80s, such as recycling, wheelchair access and sign-language interpreters. While her work with her husband was recognized internationally, she was also very involved locally. She could be seen each year whipping cream at Beacon Sloop Club’s Strawberry Festival, and her stone soup was the magnet that brought people to the Beacon waterfront, where the city dump was ultimately transformed into Riverfront Park. She was a member of the Beacon Sloop Club; Southern Dutchess NAACP, from which she received a Freedom Award; Wespac, from which she received the Peace and Justice Award; the Dutchess Junction Firehouse Ladies Auxilliary; the Mid-Hudson Progressive Alliance; and Clearwater. 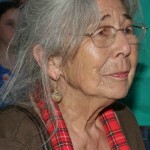 In addition to her husband, survivors include her son, Daniel (Martha) of Topanga; daughter Mika (Joseph Bossom) of Tiverton, R.I.; daughter Tinya of Beacon, N.Y.; eight grandchildren, Sonya Cramer, Rufus Cohen, Tao Rodriguez-Seeger, Cassandra Seeger, Kitama Cahill-Jackson, Moraya Degeare, Penny Bossom-Seeger and Isabelle Bossom-Seeger; three great-grandchildren, Dio and Gabel Cramer and Liam Oulton; and many nieces and nephews from the Ohta, Dixon and Seeger families. She was predeceased by her parents; her brother, Allen Homare Ohta; her half-sister, Aline Dixon; and a sister-in-law whom she raised as her own daughter, Penny Seeger. A celebration of life is being planned for a date in the future. Donations can be made to any of the organizations listed above. Arrangements are under the direction of Jarett D. Quick at Libby Funeral Home. To leave a condolence online, visit www.libbyfuneralhome.com.